Kids are loaded back in the car and ready for the next store. What my real selfies look like! This picture was literally taken five minutes later when we got to Costco. This is not good. My kids will take a five minute power nap instead of their usual nap and be set for the rest of the day. I don’t know about you but I need those naps to survive. So if you ever see me driving around town yelling at my kids to “hang in there” and don’t you give up on me”, that is me trying to keep them awake until I can get them in their cribs. Quick side note from the day. 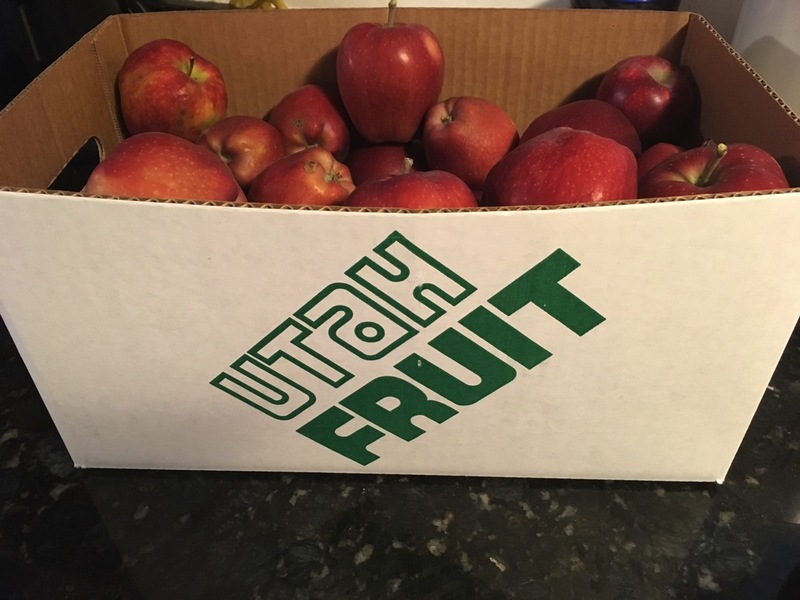 This box of apples has been sitting on my counter for the past week and none of my kids have touched them. 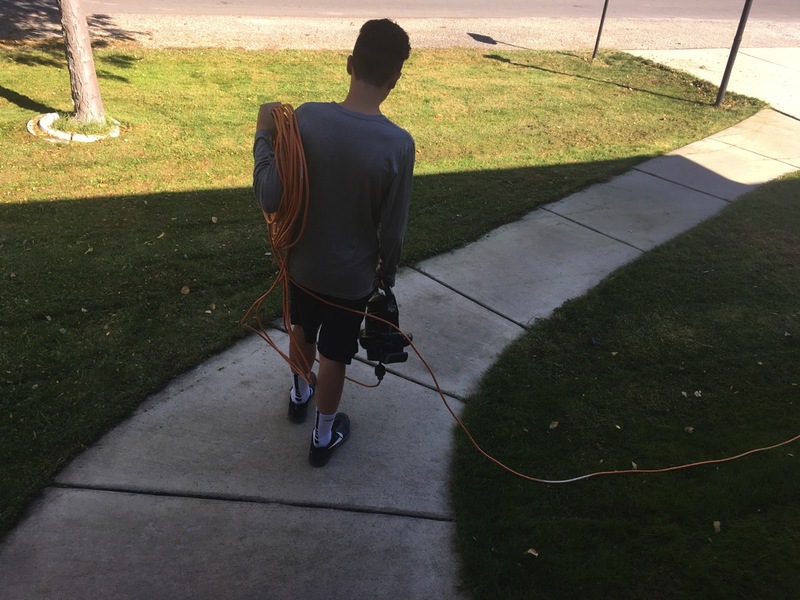 When the older kids get home from school it’s time for homework and chores. Then its time to quickly get ready and head off to the neighborhood Halloween party. 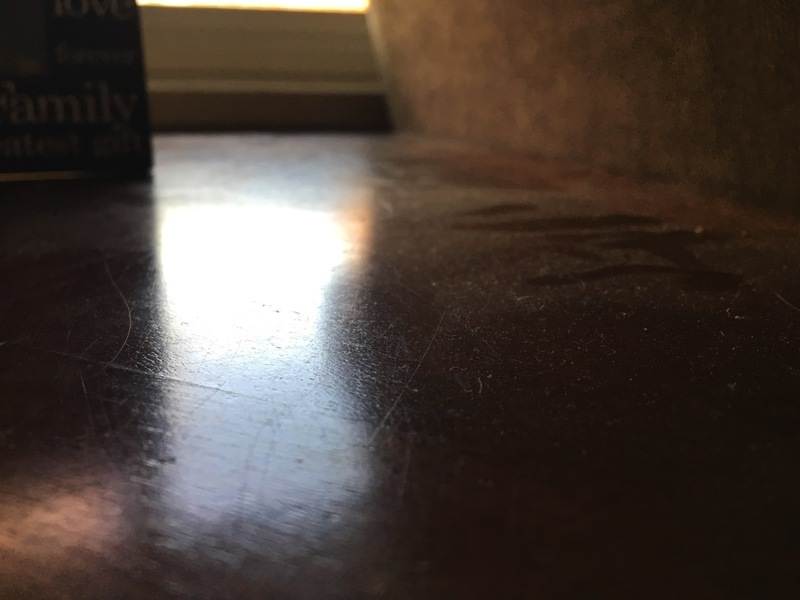 This is the dust that has been accruing on my table. Once again, this is something I did not get done today. I was going to take a picture of my laundry that is piling up but decided that might be taking it too far. I don’t want to disturb you guys :) What I am trying to show you is that today I didn’t get any of my house work done. My house is not perfect but I do have cupboards full of food now and I count that as a win in my book. Any tips on shopping with kids? What is your typical weekday look? Do your kids think the food you prepare for yourself tastes way better then their own food….or is that just my kids :) ? I don’t have kids, but I’m pretty impressed you can push two shopping carts! I’ve carried two of the handheld ones before when there were only huge carts around, and I really needed the smaller one, but I’ve never pushed two–especially with kids in it. You are rocking it, girl! And, looking awesome doing it! We do not have any kids and there is still that amount of dust on our furniture;) Props to you! I totally agree! I sometimes feel like I’m living in the “Groundhog’s Day” movie, where I am just doing the same thing over and over again! I can relate to leaving food out for a minute, coming back and finding it gone. My cat will happily eat anything I leave out of my sight for two seconds! I rarely get my housework done during the week and I have 0 kids, so hopefully that makes you feel a little better! Thank you. Thank you. Thank you. That does make me feel better! I LOVE it!!! What an awesome post!!! I wake up and walk the dog. Then it’s coffee and eggs and tv on while I work from my sofa in running gear. I always try and break for a run mid morning but it sometimes gets pushed to after lunch or even not at all. This is great! I’ve never thought of having to push two carts. Impressive! I too park right next to the cart corral, not for small kids anymore, but I figure if you’re close enough to the corral you’re not going to leave a cart rolling around the parking lot! 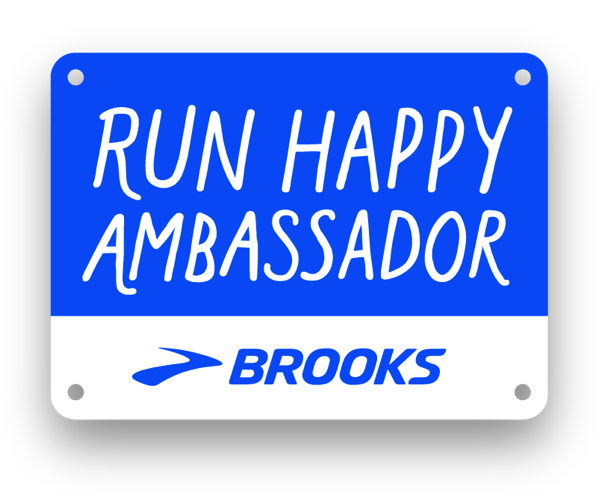 My day is early run, pack lunches, get to work, after school homework, and collapsing in bed (hopefully with a feeling of accomplishment!). That is a busy day. You should definitely feel accomplished! Awesome post! You are beautiful and so is your family. Thank you for being so real. Keep up the good work! I LOVE YOUR FAMILY!!!! And, Sissy, if THAT is what you look like BEFORE getting ready. Lord bless. You are gorgeous. It’s comforting to know that even someone who always looks so put together has normal mom days. I’m currently sitting at my desk at work with freshly showered hair. I shook it out of the towel and hopped in the car. It was a rough morning and my coworkers are honestly lucky that I made the time to shower. I will be wrestling it into some sort of bun or ponytail type thing shortly. Thanks for being so real. It really helps everyone realize that these days are normal and they’re just fine. PS – You look gorgeous even without the makeup and fancy hair. Your husband is a very lucky man. This post is awesome! Thank you for being real with us. I am a new mom (4 month old daughter) and I admire all you can get accomplished. Just like you said we often compare ourselves to others perfect instagram posts and I SO appreciate you being sincere and showing that not everything is perfect! Congratulations on your baby! Those first few months are awesome but so hard! Wow, you’re amazing. I hate grocery shopping with a passion. When I remember to do it, I try to order through peapod or something, so that I don’t have to waste time. I used to think it would be too expensive, but usually it ends up cheaper for me because it prevents impulse buys. That is a great suggestion! Do they deliver produce? Yes! And I’ve never had a problem with it. Nothing has been bruised or in bad shape. Memories! Kids grow up too fast and although the day to day can be overwhelming it just goes by too fast. I remember days when I stayed in my Jammie’s most of the day and sat in a room crammed with toys and kids and just had a down day. Then there were days I was “dropping the mic” because I got all the things done. My kids are 21-28 now and I just love being able to see them! I think you look fantastic! I’m so glad to hear other mom’s have had jammie days. Thanks for your comment! I don’t have any kids left. They ditched me. But when they were home they definitely at my food. No one comes in the kitchen unless I’m in the kitchen preparing something and then…everyone’s hungry. And then I need to prepare for everyone because I’m that person. Is it a mom thing? I find myself surprisingly not hungry. And even with all the kids gone, my husband has that same problem. I made a deal with my husband years ago that if he would stay home with the kids while I grocery shopped I would never ask him to go to the grocery store. He loved this deal and it worked like a charm. I always got to go by myself..sunglasses and headphones. Now I see shopping carts that look like cars? They’re huge. You guys are rock stars. I don’t know how you do it. You are amazing. And on a final note: if someone is swiping a white glove do NOT come to my house. I won’t pass that test. So sweet, I love that your little boy was chewing on the shopping cart! My mom used to say the same thing when we were kids – it builds their immune system, so I’m a believer! My days usually involve a ponytail and bun as well. I hate having my hair in my face! Love the guests posts – keep them coming! Thank you! He is always sucking his thumb too so I can’t even begin to imagine all of the stuff that he’s introduced to his little body. 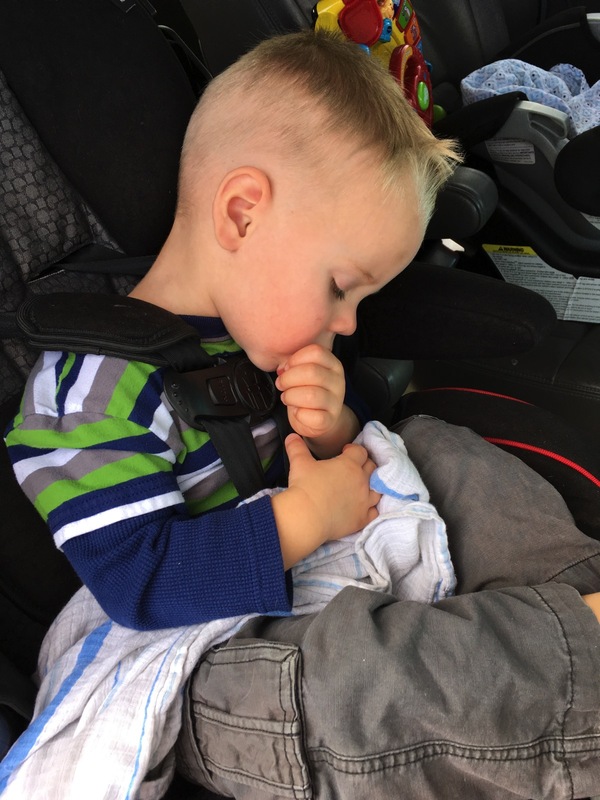 so I knew someone back when my son was little who would keep a spray bottle of water in the front seat and if the toddler started to doze off in the car before true naptime, she would spray him to keep him awake! how awful! lol. I recall those quick car naps that ruined the real long nap – we need those quiet moments when the kids take a good nap to keep going as moms! My normal look every day is business casual. Because that’s the dress code at my work. I don’t have any kids yet, but when I was one, I used to always take a bite out of my Mom’s sandwich. I still do it sometimes. She always makes fun of me for that. Haha, I remember trying to keep my kids awake in the car so they could get a good nap in at home!! Now that I’m teaching again, it’s mostly business casual. I always love to see what people’s work days look like. I guess I’m nosy like that. 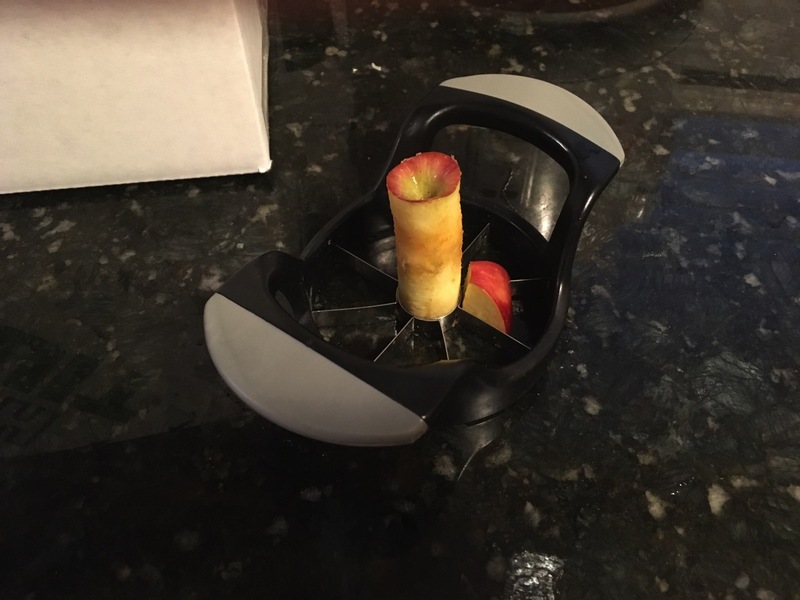 I use the apple core slicer too. It makes eating apples so much easier right? I love my apple core slicer!!! Oh gosh I wish I had tips, but I am the mother opening the groceries in the store to give her kid a treat just to fend off the meltdown. Then feeding her more of the above mentioned treats on the way home to keep her awake because I too cannot lose that nap. Busy busy with all those kids – they are SO cute!!! What a beautiful family! Typical weekday look is professional until I get home, and then it’s immediately into sweats or PJs. I think that even if I was able to wear sweatpants to work, I’d still want to change into another pair when I got home. I remember my dad (university prof) would come home, hug everyone, and then immediately go upstairs to put jeans on. He called it “putting on play clothes”. 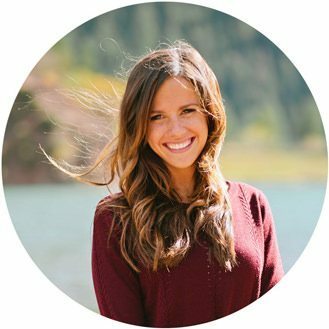 I love your guest posts! Thanks for sharing your day-in-the-life. That is great your grocery store does that. I’m am going to start petitioning mine to do it too:) Thanks for your comment! My tip when shopping with kids…..Remember its NOT ABOUT THEM at this very moment (and the whole time shopping!) no matter how much they whine, cry, throw a tantrum or complain I tell them shopping is part of life and we are getting it done. No bribes by this mom…..
HaHa! You sound just like my mom :) Which is definitely a compliment! Authentic and vulnerable….great qualities!! I’m an old woman now and wish I’d worried less about the “stuff” and the comparisons and appreciated more what I had and who I had to share it with! Haha, funny post! 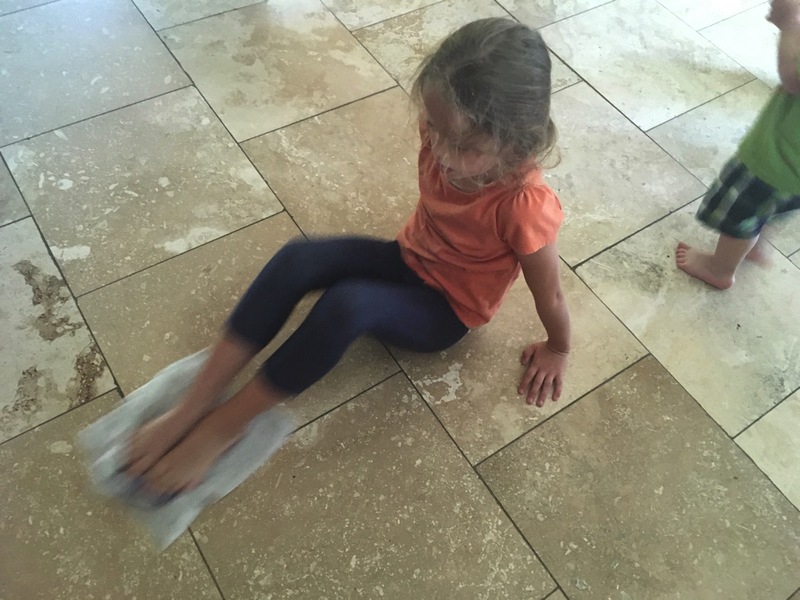 My kids do the same thing with a box of fruit laying around…..watch out if it’s a bag of Hershey kisses though! And I agree with other commenters, you are gorgeous and don’t need any makeup! I always wore one of my little ones when shopping and tried to get in and get out as fast as possible. There is a 3 year age difference though so with the older one I used to give her a scavenger hunt with pictures and a snack. I find it harder actually now that they are 9 and 6, more outloud opinions!!! I love going early or really late. I also took advantage of a free delivery coupon for 2 months from a local delivery place. I also always ‘wore’ my babies at the grocery store. Makes it so much easier! And scavenger hunts for my toddlers saved me from having them run away constantly. Those are great tips…thank you! I see other moms wearing the front packs and wish I could, but with my bad back it’s not in the cards…..oh well. That scavenger hunt sounds fun! Run it past your doctor, a friend of mine has back issues and has no issues with her ergo carrier. She said if the weight is spread out and she only days it a few times a week it is okay. She used to do the moby wrap but her little one is 35 lbs now so no longer an option. I believe she wears the ergo on her back and not in front. Packs like baby bjorn are very hard on the back. I will have to look into that. I know with my front pack anytime I have put it on it immediately hurts my back. So I assumed they would all be that way. If there is a brand that doesn’t hurt it would be wonderful! Thanks! Pushing two carts, you go girl!!! Shopping with kiddos is hard work! Oh girl, I haven’t vacuumed in weeks lol. You are my hero for taking two kiddos grocery shopping! I love your honesty in this post. Being a mom is hard work but you do it well! So glad to hear I am not the only one behind on housework! Thanks for your comment! My typical day looks a lot like yours! I have 4 kids though so maybe less hectic and a little easier. I start off by getting the first three ready and driven to school and then I hit the gym. I come home and do all the things stay at home moms do that no one can ever see (like mow the lawn, mop, clean bathrooms, laundry, etc plus all the supriroses along the way). Finally I get kids home, dinner, baths, homework and family time and then bed for them. You are amazing! Being a stay at home mom is definitely a full-time job! I love that you’re honest about selfies!! Also- now i know how you’re in such good shape- you push 2 carts at once! 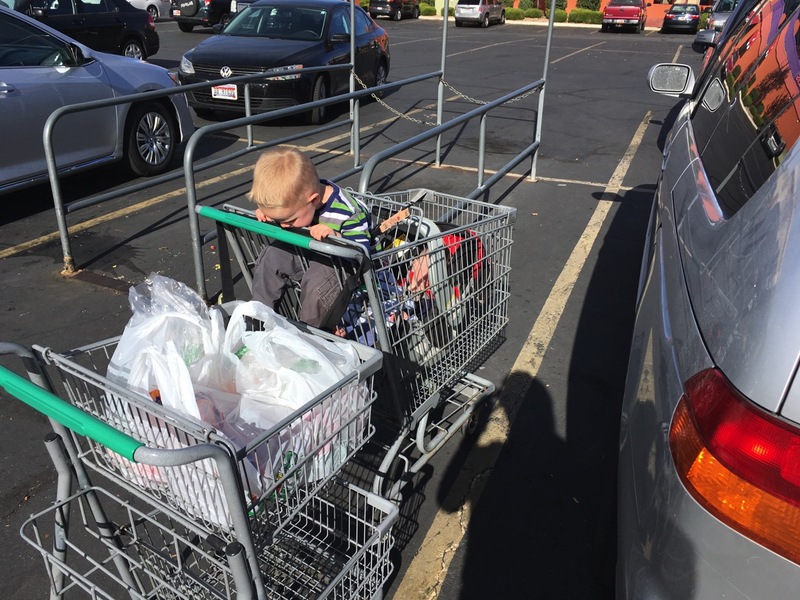 Shopping with TWO carts – you are a beast! And I totally understand the kids + shopping cart dilemma! I have two little ones and when shopping at target there was no place to put my littlests’ infant car seat… He ended up IN the cart basket area and my toddler sat in the front = zero room for groceries! Sooo… I pushed kids in the cart and carried groceries in a basket :) I felt weird, but it worked. You sure rocked this day and you look gorgeous while doing it! If I fix up my hair all cute and manage to get decent meals on the table (while keeping kids alive), that is a day well done to me. Thank you for sharing! Your family is beautiful. Great post! Do you have an instagram account that we can follow along with you as well? I am a Mom of triplets plus one. The triplets are now almost 16 and my baby is nearly 12 ? , but back in the day I was able to push a triple stroller and pull a cart. Shopping trips were a busy event to say the least. 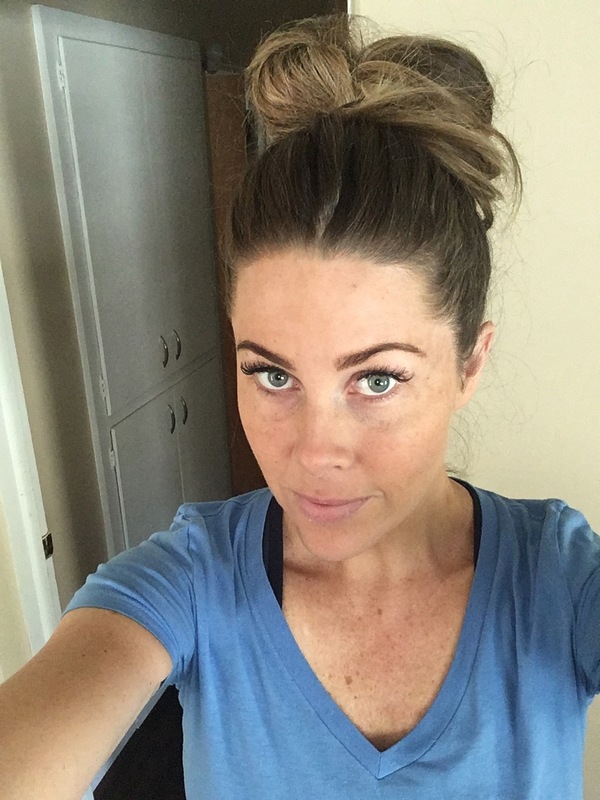 Nowadays my daytime look is dressed for work, which starts über early, but right after I get in my workout then jump right back into Mom mode running kiddos around and usually do that in my workout clothes and a quick ponytail. Do some things never change ? 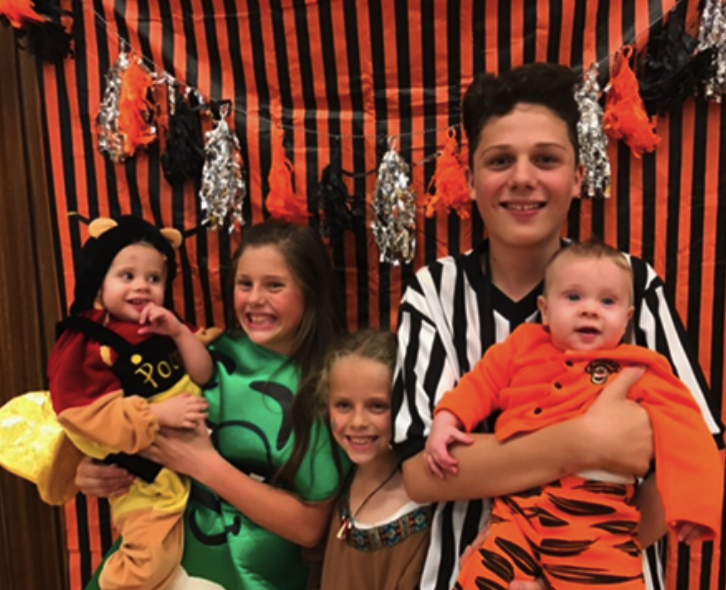 Your kiddos are super cute, enjoy these busy days they go by so fast! You are so real. And so funny. No wonder we simply love you, Sissy! I love your guest posts! You are so genuine, and very funny too. You are absolutely gorgeous and you have a beautiful family. I think you should start a blog :). You are the cutest!!!!! I was cracking up too! I think you’re doing great! Thank you for this!! Really! I love seeing more behind the scenes mom life. I have 2 kids, one almost three and the other is 14 months. I also get upset with all other non-Costco carts. I always let the eldest ride in the cart and pretend I don’t notice the dirty looks from the grocery store employees. ? Looking forward to more posts from you! ? This is totally true.. thank you for being so realistic in your post. Priorities are kids..and not dust. Sissy, please start a blog. I promise I’ll still be a devoted follower of Janae’s, but I need to read you everyday as well! The only problem is it makes all my impulse chocolate buying almost nonexistent. *I’m not affiliated with Wal-Mart, just in case this sounded like an advertisement. **Wal-Mart, I’m open to your sponsorship in exchange for free groceries. This is a beautiful day……joyful exhausted!!! I just love this!! So real…and you are seriously a real life superhero for being able to push two grocery carts around!!! 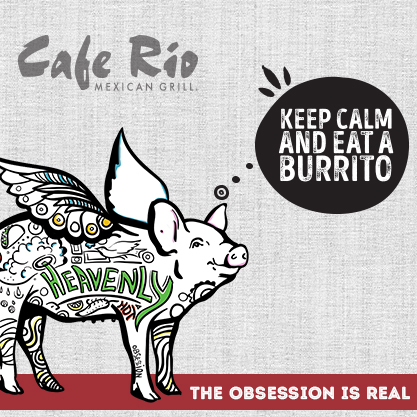 Holy cow, you are amazing (and look amazing)! 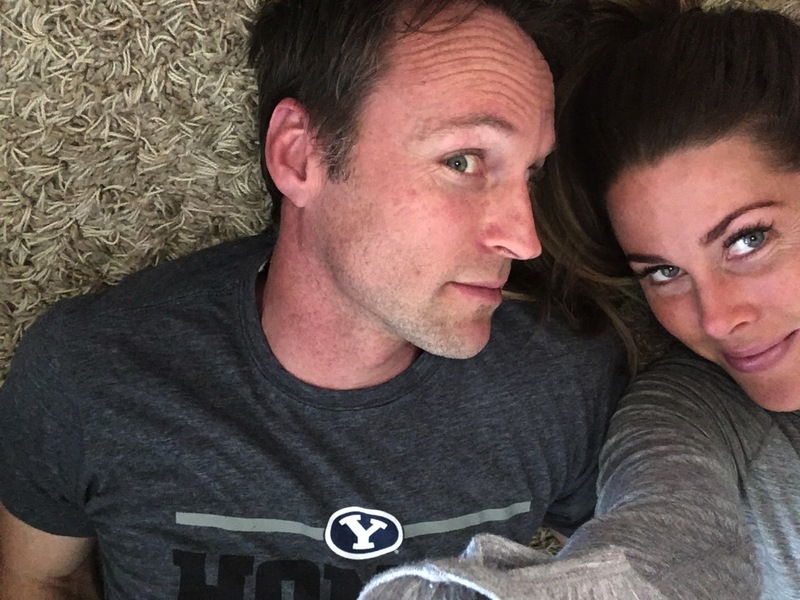 I don’t have any kids – just work and grad school – and keeping my house together is hard enough! When I have my niece and nephew here (4 & 2), which is often, I can literally get NOTHING done, and my house is a complete disaster by the time they leave. I always give my sister props b/c I have NO clue how y’all do it ? Btw, your kids are beautiful! 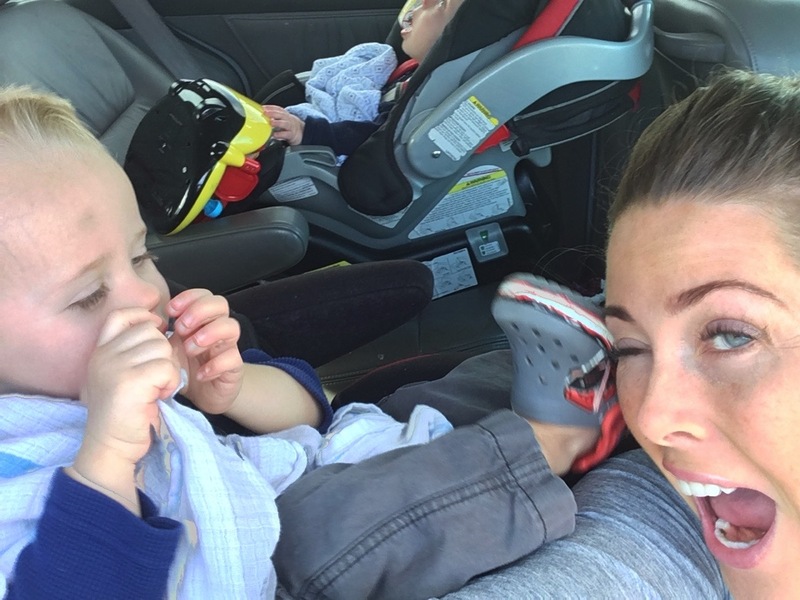 I remember those days when I am trying SO hard not to let the kids fall asleep in the car because I needed that nap time (for me to do stuff around the house)…. funny thing is, the older one would sleep all the time but the younger one was always a battle for her to take a nap. At one point, I gave up. 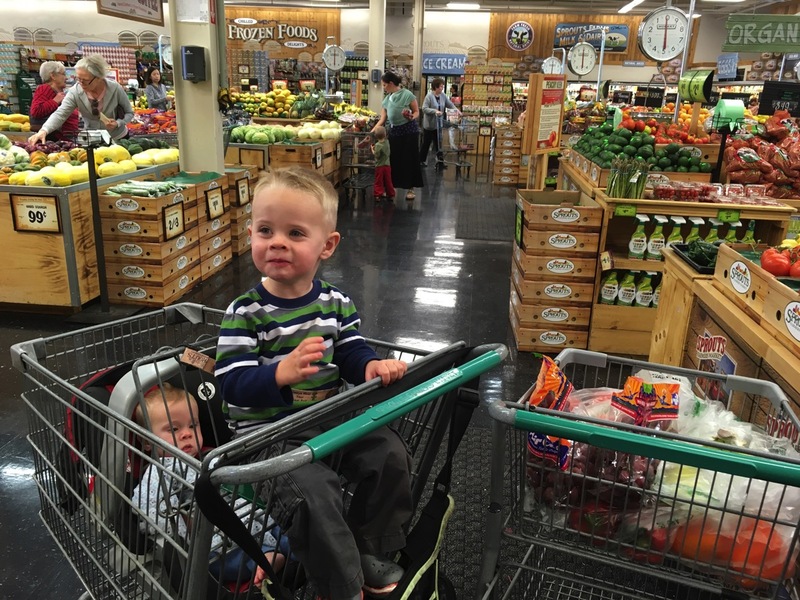 Going grocery shopping is still hard sometimes, and sometimes, it’s super easy because they have become huge helpers. 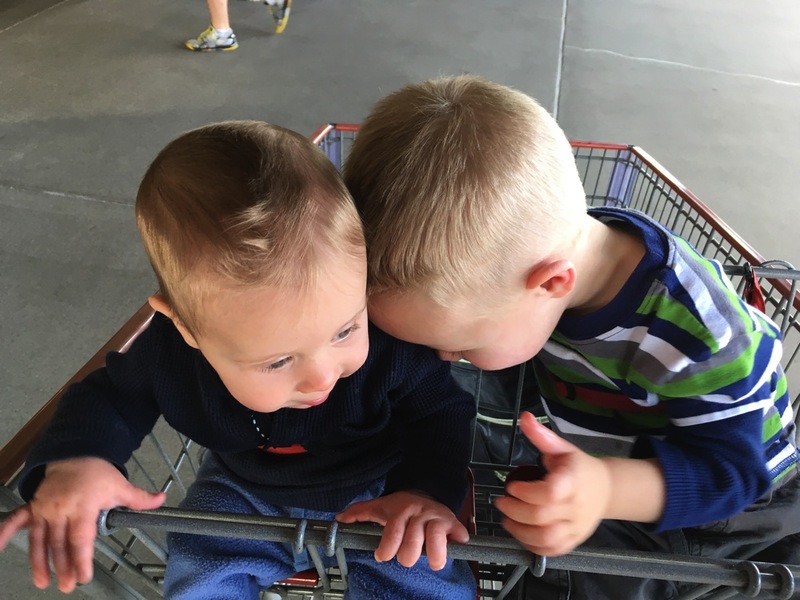 Hard ones are when they won’t stop bickering or arguing with each other while I am trying to get the grocery shopping done quickly. Thanks for sharing! I don’t have kids, but have been talking to my fiance about how I don’t know how people go their whole lives being so busy and getting everything done. I am struggling to work full time, train for my first half marathon, keep the house clean, planning a wedding, and making time for family. Everyday it seems like I fail to complete half of my chores, but seeing your comment about the dust on the table vs food in the cabinets made me feel better about life. Thanks! TLDR: Thanks for sharing about how you are a normal person!